Context: finished this off as we made a long and very snowy drive back from up north to Cambridge. 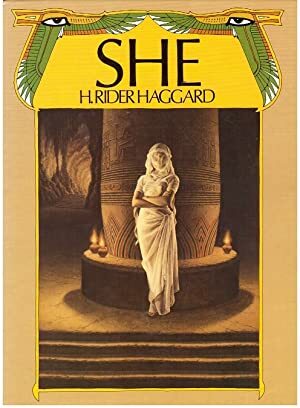 Influential in terms of its contribution to the sci-fi fantasy adventure genre, controversial in terms of its portrayal of sexuality, I’d not heard much of this novel before listening to it via librivox.org. I’ve read a large number of these Victorian adventure sagas and I don’t on the whole like them much. This explored moral themes a lot more than Wells and Verne do I thought, but, for that, it wasn’t as engaging as their work. Haggard is trying to deal with the ideas of humanity and questioning human frailty and power and I think, for the time, the devices he uses would have been very powerful. You’ve got the immortal, omnipotent woman Ayesha who holds absolute sway over her domain but seems not to have heard of the British Empire. She’s so overwhelming beautiful that she’s awful. Or perhaps that should be awe-ful. Haggard I think does achieve a large degree of success in questioning what beauty and power and life are all about. I think these are relevant issues for today. But I found a lot of the discussion and imagery a bit dated, which is to be expected of course, and so found it dragged in places. I’m glad I’ve read it but I didn’t desperately enjoy it. In giving to the world the record of what, looked at as an adventure only, is I suppose one of the most wonderful and mysterious experiences ever undergone by mortal men, I feel it incumbent on me to explain what my exact connection with it is. And when that final development ultimately occurs, as I have no doubt it must and will occur, in obedience to a fate that never swerves and a purpose that cannot be altered, what will be the part played therein by that beautiful Egyptian Amenartas, the Princess of the royal race of the Pharoahs, for the love of whom the Priest Kallikrates broke his vows to Isis, and pursued by the inexorable vengeance of the outraged Goddess, fled down the coast of Libya to meet his doom at Kor?